Or maybe it’s all a matter of perspective. After all, in Nashville Chrome the human heart is very much a factor, and this time the fiction has come more or less straight from history. Bass (The Lives of Rocks, Why I Came West) has explained that, on a visit to Nashville to interview Keith Urban, he came across the story of The Browns, a 1950s singing group comprised of three siblings: Maxine, Bonnie and Jim Ed Brown. The Browns are a now obscure band who were, in their day, at the heart of “New Nashville Sound.” As a group, they had several number one hits (notably “the Three Bells”) and behaved pretty much as Nashville royalty is expected to: at one time, Maxine dated Johnny Cash, Bonnie was engaged to marry Elvis Presley and the Beatles said that The Browns were their favorite American band. And then... obscurity. In Nashville Chrome, Bass looks a little at what was, but mostly he looks at what might have been and what, in a way, may still yet be. For a little while, the children -- Maxine, Jim Ed, Bonnie -- were too young to know the weight of their gift, or even that their lives were hard. 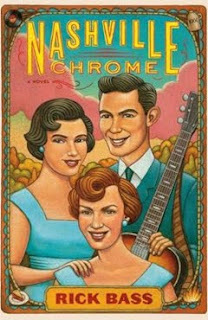 In Nashville Chrome, the days that were -- the might-have-beens -- are woven through with scenes from an entirely fictional present, one where once vibrant Maxine scrabbles with her waning years while scheming for one last hurrah.